Selecting a packaging option for a hand tool can be difficult because there are so many different options available. Tool packaging differs from packaging for most consumer good items because it is typically more rugged and built to hold heavy items or items with sharp edges. Clamshells are a great option for tool packaging because they can be designed to hold heavier products. The PVC can be designed to provide appropriate support for these larger items with support rails, or can be made with a thicker gauge plastic to support the weight of power tools. Clamshells are also useful for concealing the sharp edges for items like saw blades or knives. By concealing and protecting the sharp edges the packaging makes the product safe for consumers to handle. Another benefit of using a clamshell is that they can be perimeter sealed. This is not only useful for consumer safety, but also adds extra security for the item. RF sealing, or Radio Frequency, is recommended for sealing a package that is theft proof. UV (ultra violet) sealing is another option but there are detractors for this sealing option that complain of flow marks of the adhesive in the flange area taking away some of its intended luster. High end power tools such as power screw drivers, drills, screwdriver sets, saws, jigsaws and more can afford the more expensive Clamshell alternative due to the higher price point. A transparent, glossy and rigid outer shell conveys quality to a consumer. Clamshells can also be custom molded for tools and can by designed to hang on a hook or stand independently on a shelf by incorporating a ‘sombrero’ hang hole in the top flange or a ‘tri-fold” design in the base, respectively. Another popular method of packaging for tools is banding the tool to a card. The main positive feature of this packaging method is that it allows the consumer to actually touch and hold the product without removing it from a package. Typically a tool is banded to a printed card and displayed in a tray or on a hook. 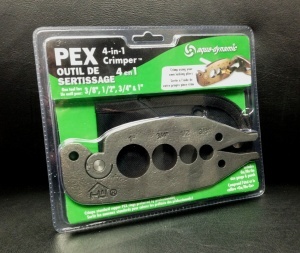 It is important to remember “theft resistance” or “tamper evidence” when considering this open-style packaging option as more expensive products and especially tools are targets for would-be thieves. There are ways to package a product so that it can be handled but not removed from the package. Shrink wrapping a tool is another option that allows the consumer to touch and feel the product. Products can be shrink wrapped with a printed insert that can used as billboard space for product use, graphics or instructions. Shrink wrapping is typically used if a tool or hardware is already in a box and is found with middle to lower end price points, but not always. Shrink wrapping can protect your product from dust, dirt and moisture and provides an appealing gloss finish that is less expensive with a PVC blister or clamshell package. Once the primary package has been determined, finding the appropriate method to display the packaged tool is the next step. Custom chipboard trays with printed graphics can show how the tool is used and can help draw interest to the product. The display trays can have either a custom corrugated insert of a die cut foam that will organize the product vertically for a good visual and a convenient ‘facing’. Consult with us to learn more about security in packaging and what options are popular based on the product you are trying to retail.